Welcome to the Karina Dresstacular™ Event! You are invited to join Simply Stacie and a fabulous group of bloggers as we have the pleasure of partnering together to introduce you to all the beautiful dresses available at Karina Dresses! 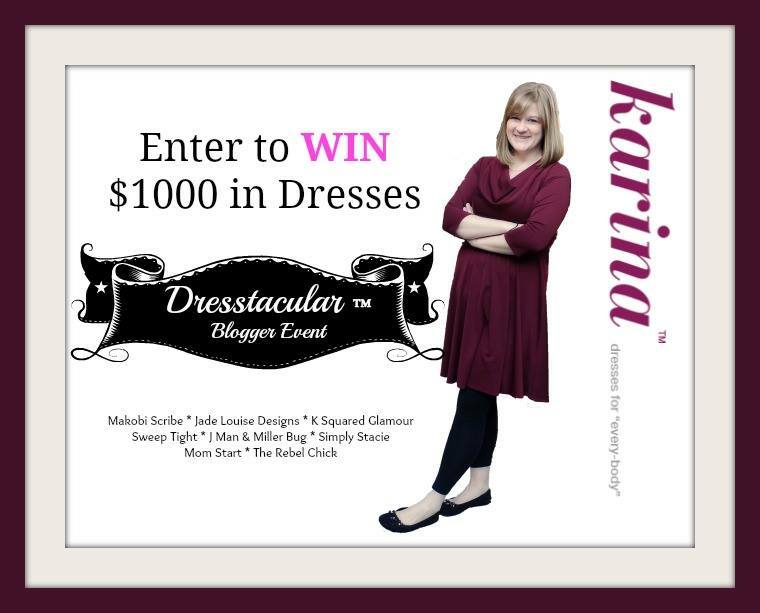 Not only will you get to see a great selection of lovely dresses to update your fall and winter wardrobe but you will also have a chance to enter to win $1000 in dresses from Karina Dresses! I am so impressed with the beautiful styles, patterns, prints and colors and every Karina dress was designed to flatter the bodies of real women. I am slowly yet steadily losing the weight that I gained during my three back to back pregnancies and to be honest, I normally avoid wearing dresses because I tend to feel dowdy in a size 12/14 dress from other brands. However, whenever I wear a dress from Karina Dresses I actually feel pretty and feminine! I have gotten many compliments from my husband and friends in my Karina dresses that it has really given me a boost of confidence. I recently wore the Audrey dress from Karina Dresses on a romantic evening out with my husband and it was not only stylish but extremely comfortable to wear due to the luxurious feeling fabric that flows so nicely over the body. You would think that a dress this nice would need to be dry cleaned but caring for my Karina dress is so easy as I simply machine wash on the cool, hand wash cycle and then let it air dry naturally. I don’t even have to iron it so it is the perfect dress to pack for traveling too. SO cute 🙂 love the dress and the color! The dress looks awesome! Love the pairing with leggings and flats! So cute! Loving all the Karina dresses! I would totally rockany of them! What a great dress! Purple is such a lovely colour. Karina dresses have such wonderful designs. My wife would look gorgeoud in that.The colour would suit her perfectly. I love the dress! So simple, but yet really pretty! Classic!